Are you a savvy social media reporter, blogger, journalist in the field of science, technology and/or space? 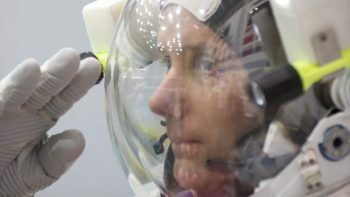 Then join us for the joint ESA-CNES launch event of ESA astronaut Thomas Pesquet next Thursday, 17 November 2016, in Paris. Thomas will blast off to the International Space Station ISS from Baikonur, Kazakhstan around 21:20 CET/local Paris time, with the event starting at 19:00 CET. While the launch event itself will take place at La Géode in Paris, social media reporters will be located at the amazing Fablab of Cité de Sciences, directly opposite La Géode, which will be equipped with performant wifi and wired LAN connectivity, of course tables, chairs and a large screen to follow the live video transmission and catering. Before you apply, please make sure you check here that you meet the eligibility criteria, then register here by 13 November. Overall capacity and in particular places during the event at La Géode are limited. Please note that this is not a SocialSpace (former SpaceTweetup), but a social media journalist accreditation for a joint ESA-CNES launch event, with both VIP’s and the public taking part. You will be provided with interview possibilities and may of course use photograpy and video. If you will be accredited you have to bear the expenses related to your travel to and stay in Paris. In case you can’t make it, you may follow the launch live on www.esa.int or at livestream.com/ESA/. Also make sure you follow Thomas on Twitter, Facebook and Instagram.